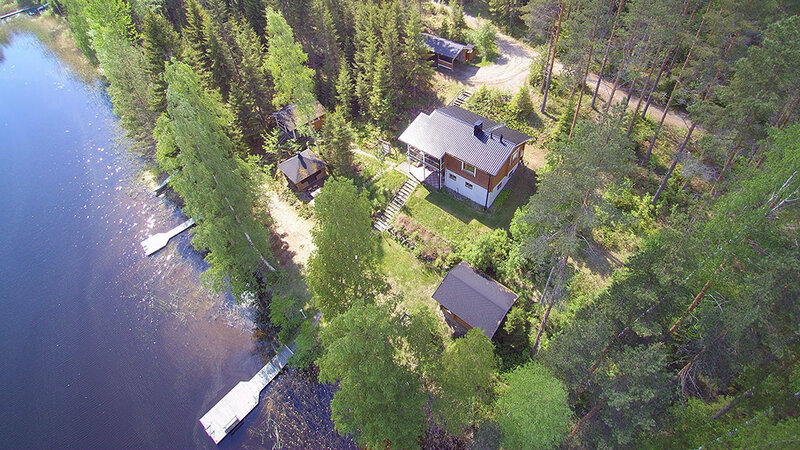 Mäntyrinne is great cottage for especially families and groups of friends. Pets are also welcome. The Mäntyrinne holiday home comprises a main cottage, beach sauna, barbeque place, sleeping cabin and carport. The cottage is situated on a slope and offers wonderful lakeside views. From almost every window you can see the lake, but you can’t see the neighbors. Both the garden and the shallow beach are child friendly. The yard is partly constructed slope and partly, next to the beach flat lawn area. For children this yard offers a multiform, close to nature ground for play and games. The sandbox is great for the smallest children. The beach is shallow and there is two piers just for Mäntyrinne cottage’s guests. The beach has a firm, gently sloping floor of added sand. The beach near the beach sauna is shallower than other parts. This part is perfect for small children. The water at the end of both piers is deep enough to swim in. Also great fishing possibilities starts already at the ends of the own piers. The population of pike, pikeperch and bream are strong. The main cottage is situated in the slope and is in two floors. Entrance is downstairs. There is two bedrooms in the main cottage one upstairs and one downstairs. The one upstairs has a double-bed. Also kitchen and living room are upstairs. The living room sofa can also double as sofa bed for two. The sleeping cabin is for a summer and autumn use and there are beds for two persons. Mäntyrinne holiday home has two saunas: one downstairs in the main cottage and one in the separate sauna building on the beach. Both saunas are wood heated. In the first floor of the main cottage there is also bathroom with shower, a toilet and a dressing room with washing machine. Upstairs, from the kitchen, there is a 11 square meter balcony with marvelous lakeside views. Besides from the lake, during summer and autumn time you get real local food from the forest. You can pick blueberries, lingonberries and mushrooms starting from the corner of the main cottage. In July you can also buy strawberries, potatoes, organic granola and marmalade directly from the farm situated 500 meters away. Prices from: 724 euros/week and 311 euros/weekend. Final cleaning: 110 euros. Sheets & towel set 18 euros per person, or you can bring your own. Between middle of June and middle of August, the minimum rental period is one week and the arrival day can be any weekday.